Veronica, oh Veronica – how many ways can we love thee? Three!! We began this journey with Turkish veronica (Veronica liwanensis), followed by CRYSTAL RIVERS™ veronica, and now we say hello to the latest addition to the Plant Select® family. SNOWMASS® blue-eyed veronica is the new darling of the group. SNOWMASS® appeared at Denver Botanic Gardens as a spontaneous cross with Turkish veronica (V. liwanensis) and an unknown creeping veronica, perhaps Veronica repens, who knows, we’re not sure. What is known is that it is totally new and exciting! SNOWMASS® blue-eyed veronica dazzles with sparkling white flowers accented with a captivating blue ring in the center that deepens as the flower ages. Snowmass® grows very similar to its sister CRYSTAL RIVERS™ veronica with glossy, green scalloped leaves. It grows with vigor, filling in spaces much quicker than Turkish veronica and blooming just a tad later. 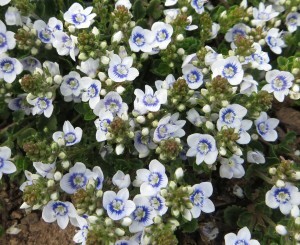 SNOWMASS® exhibits all the fabulous versatility as other creeping veronica in the garden. It is excellent as filler between stepping stones, it will spill and trail over walls, or creep as a delightful groundcover running beneath perennials and flowering shrubs. SNOWMASS® is at home in a semi xeric garden and can take a bit more water and grows best when planted in a full sun situation. Plant throughout the garden as the canvas to highlight darker flowers and it will make ‘em pop! Say hello to SNOWMASS® blue-eyed veronica, an enchanting new jewel for Plant Select®. Bedazzle your garden with its avalanche of shimmering, sapphire-eyed diamonds. Is Snowmass Veronica evergreen like Turkish Veronica? Yes, as evergreen as Turkish Veronica has been my experience as long as it does not dry out too much if there is a mild winter. Snowmass is a beautiful plant. Is it available as mail order?